I don’t normally do New Year’s resolutions. I certainly have hopes and aspirations at the start of every new year–exercise more, go to bed earlier, eat fewer tortillas, watch less tv, etc.–but I never resolve to strictly adhere to them throughout the following twelve months. I do however, feel compelled to at least gather a few library-related aspirations together. I spent much of last year wishing I’d done things a bit differently at work, so this year I’m going to stop wishing and start making some changes. 1. Write more. When my Google calendar alerts pop up, I pay attention. So I’m going to schedule some writing time for myself every week. It could be a blog post, work on an opinion piece, or if I’m lucky, the start of a new scholarly article or book chapter. I love writing but I don’t often make the time to do it. I don’t want to squash spontaneous inspiration, but when that doesn’t happen, sometimes you just need to write something. Period. 2. Stop trying to multi-task. You don’t do it well. Despite my best efforts. I cannot blog-email-Facebook-read-Spotify-listen at once. One thing at a time is a good rule of thumb for me. 3. Free yourself from the shackles of email. I don’t need to have my email tab open at all times. I don’t need to reply to every email right away. I can delete messages and will, frequently. Sometimes a phone call is the right thing to do. 4. Follow through. I have several projects going on at the moment, and rather than take on new ones, I want to make sure that what I’m working on now is either completed or well-maintained. New and shiny is always exciting, but sometimes the familiar can surprise and fulfill you. 5. Value your time. This one is vague, I know, but it’s intentionally so. As librarians we’re so conditioned to be grateful when colleagues and patrons want our help that we often sacrifice our own time to help others. Yes, we are in a helping profession, but we are professionals with our own responsibilities and interests. To protect my own peace of mind and stave off burnout, I will place a premium on my own time, both at work and with my family. 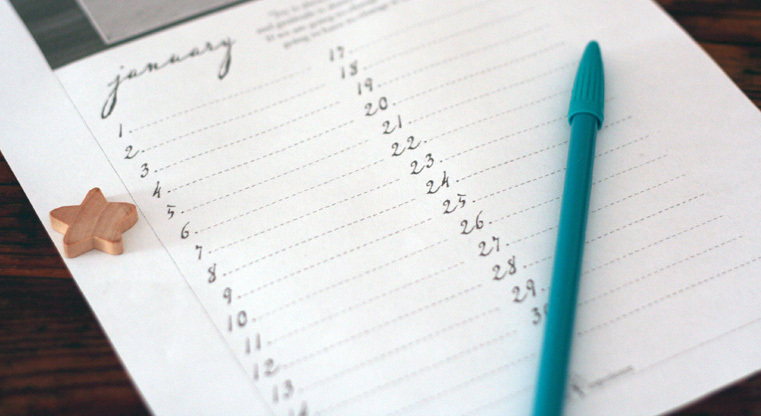 What are your work-related resolutions, aspirations, or hopes for the new year? Great ideas, Veronica! I tend to do new year’s resolutions, or something like them, on the academic calendar, and combining a couple of the things on your list has worked well for me since September. Like you, I wanted to commit to a more regular writing habit, so I’ve designated 9:00-10:00 every workday morning as writing time. I’ve let close colleagues know this is “important but not sacred,” so if they need to schedule me for the occasional 9:00 meeting, that’s fine, but it hasn’t been all that hard to protect that time. Starting each day with a bit of writing makes it possible to do this *before* opening my email, which has made a big difference, and writing early often gives me a real sense of satisfaction and accomplishment. It has helped me a lot, too, to map out my writing intentions a week at a time. Rather than face afresh each morning the challenge of “What do I write about?? ?” I already have a note to myself that I’ll blog about a particular aspect of a project, read and respond to an article for a bibliographic essay, write reflectively about a question that interests me, etc. This approach is probably not for everyone, but it has let me stick with my writing resolution for several months. I was thinking of scheduling out an hour or two 3 times a week. I really like the way you’ve written notes to yourself with different writing ideas. I think I’ll try to replicate that approach!